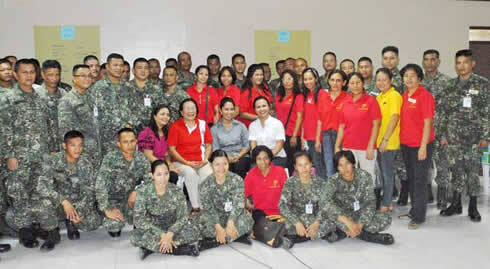 Western Mindanao State University – Women Research and Resource Center (WRRC) held a Gender and Development Training Seminar at NFWM Officers’ Club, Naval Station, Romulo Espaldon, Bagong Calarian, Western Mindanao Command (WESTMINCOM) last July 14-15. WRRC was invited by to share about Gender and Development to 100 members of the Philippine Navy and female Non-uniform personnel. The training sought to educate marine personnel, dependents and Philippine Navy on Gender Awareness and Development (GAD). It also aimed to transform the Military Service into a Gender Sensitive working environment and to implement Gender Streaming in the Military Service and in their respective homes. Speakers for the different topics were Prof. Rosalyn R. Echem for Basic Concepts on Gender and Sexuality and Mrs. Darlane Sabellano for Responsible Parenthood. The second outreach program was held at CSSB Mess Hall, NSRE, WESTMINCOM last July 28, 2011. The event was participated in by about 80 Combat and Service Brigade-Philippine Marine Corps.